A veggie beet burger made by layering a roasted slab of beet with greens, caramelized onions and chipotle cashew hummus on a whole-wheat bun. Simple, clean, healthy and delicious. 2 cups cooked chickpeas. If using canned drain thoroughly. Leafy greens like baby spinach, baby chard or baby kale. A mix of spring greens would be great here also. Place a large piece of aluminum foil on a baking sheet, spray with oil, place the beets inside in a single row, and fold the foil over to cover completely. Crimp the edges of the foil to seal. Place the baking sheet in the oven and roast for 45 minutes to an hour, or until a knife inserted in the thickest part of the beet goes through cleanly and without resistance. Remove the baking sheet and let it cool for 15 minutes, then open the foil and let the beets cool until they can be handled. Peel the beets by rubbing the skins off, then slice into 1/4-inch-thick slices. Heat the olive oil in a wok or large saute pan. Add the garlic, sage and salt. Add the beets and salt and saute for about five minutes. Sprinkle on the lemon juice and set aside. Place the garlic pods in a small piece of aluminum foil sprayed with oil, roll up the foil into a ball, and roast with the beets for 30 minutes. Once they are cool enough to handle, discard the skins and reserve the gooey, roasted garlic. Place the chickpeas, cashew nuts, roasted garlic, chipotle chili and salt in a food processor. Add enough water to make a smooth paste that's thick enough to smear on a burger bun. Blend into a really smooth paste. If you are using the extra virgin olive oil, pour it in through the feed tube as the hummus is blending. Heat the oil, add the caramelized onions and a pinch of salt. Saute for a minute, then add the ground black pepper and sugar. Continue to cook, stirring frequently, until the onions become golden brown and soft. Turn off heat and remove to a bowl. 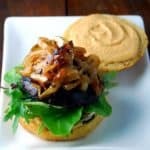 To build your burger, cut a whole wheat burger bun in half, smear some hummus on the base of the bun, layer on some greens, then a beet patty, and finally some caramelized onions. Smear some more hummus on the top half of the bun before capping off your burger. To make the hummus nut-free, substitute cashews with 2 tbsp tahini or sesame seed paste. Nutrition info below is for the beet patty, caramelized onions and chipotle cashew hummus. Does not include greens and burger buns.